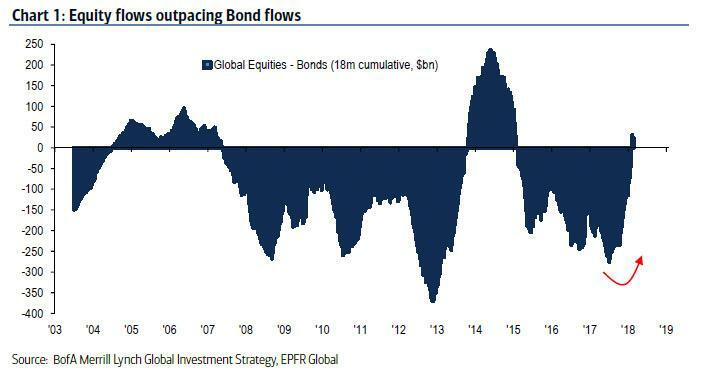 Bank Of America: "Here Comes Volatility"
Looking at last week's "risk on" capital flows, BofA's Michael Hartnett writes that according to EPFR data, there was a $13.2BN inflow into equities (split $7.5BN into ETFs and $5.7BN into mutual funds), $5.2BN in bonds, and $0.4BN in gold. This was a notable shift, because as the BofA CIO highlights, this was the 1st time since the Great Rotation of 2013, that equity inflows have outpaced bond inflows past 18 months. 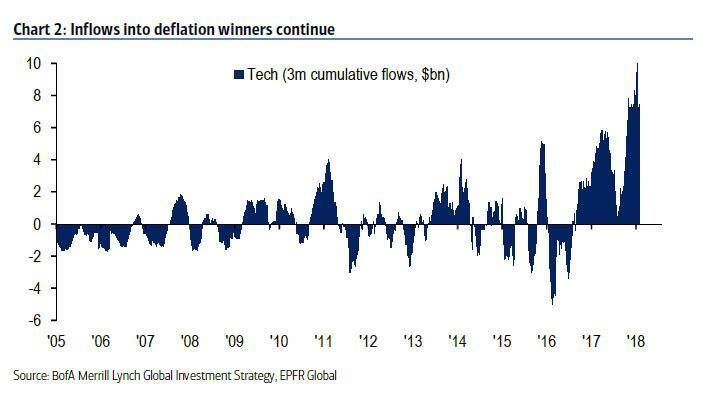 Another surprising observation: the bulk of the flows have been deflationary, as a "higher growth/higher rates backdrop not reflected in other flows" as inflows continue to deflationary winners of tech (Chart 2), IG bonds, EM bonds/equities. 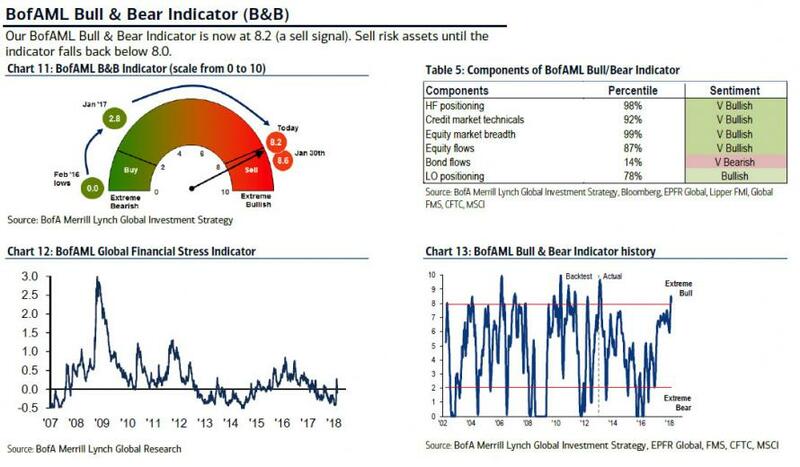 Going back to the original indicator which prompted BofA to - correctly - predict an imminent correction at the end of January, Hartnett writes that the bank's proprietary Bull & Bear indicator remains stuck at 8.2. In other words, just like Goldman's pointed out earlier this week, this suggests that excess optimism continues on risk assets, thus the "pain trade for stocks & credit still to downside"; note however the coast is getting clearer for Emerging Markets, where the flow trading rule “sell signal” triggered on Feb 1st, now subsides back to neutral territory. And speaking of BofA's warnings, which last month was absolutely spot on in terms of both size and timing, here comes another. First, Hartnett notes that in the battle between stagflation hawks vs. Goldilocks doves, if "as we suspect data is stagflationary/ policy hawkish" then "another risk-off bout coming." That was the first warning. The second: picking up where we left off in our discussion of shifting market correlations, Hartnett calculates that the recent 5 months of lower US dollar & higher US bond yields is an extremely rare event (<10% of past 50-year history, Table 1, though v common in Emerging Markets). higher wages remains the obvious risk to investors; higher wages & peak profits/ growth much less anticipated. Here comes vol: lots of volatility events in coming weeks: Feb 28th Powell @ Humphrey-Hawkins, March 1st US ISM, March 4th Italian elections/Merkel coalition vote, March 8th ECB, March 9th BoJ & US payroll/wages, March 21st FOMC. How to position for the second round of the vol surge? Here are BofA's preferred risk off trades. If BofA's recent track record is indicative, it's about to get very stormy out there. But the most exciting thing about BofA doubling down on its gloomy forecast is that it now squarely pits two of the most popular/followed analysts against each other: one on hand, BofA's Michael Hartnett who see pain, and on the other JPM's Marko Kolanovic, who as we reported yesterday, sees only blue skies ahead. One of the two is about suffer a painful hit to their reputation.